We are in urgent need of a Chairperson (independent of any of the other groups) and a Treasurer in order for this committee to function properly. We will also welcome anyone who takes an interest, and is not necessarily affiliated with any of the main user groups, but wishes to join our committee - the more the merrier! Abernethy Pavilion Management Committee manage the Pavilion down at Powrie Park where Beavers, Cubs, Rainbows and Brownies meet weekly. Abernethy Youth Football Club and Abernethy Tennis Club also use the premises along with various ad hoc users. We are in the throes of preparing a new constitution and renewing the ground lease, and once these are done we will be ready to do some fundraising and obtain any grants we can, so this well-loved sports venue can be renovated to its former glory as it was built brick-by-brick by the local community. This year marks the 25th anniversary of the official opening of the Pavilion and the current committee are holding an event there to celebrate this on the afternoon of the 10th September. On the same day the Abernethy Scout Group are celebrating a hundred years of “Cubs” and a joint raising soiree seemed appropriate. All are welcome and those who contributed their time and money to the building of the Pavilion are cordially invited to the celebration and we look forward to seeing you there. If you have any photographs of the Pavilion taken during the construction phase we would be delighted to see them. 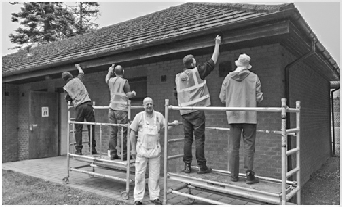 The outside of Abernethy Pavilion has recently been painted by the Community Pay Back Team. This Team who are completing their Community Service carry out painting and other general maintenance work for Charitable organisations (Scouting) and with facilities that are used by all the community, hence the Pavilion fitted all the required criteria and we were successful in our application for the works to be carried out. Although the works are all carried out by the Community Payback Team, all the required materials still need to be provided and believe me paint is very expensive. However ELES Building Services Ltd very kindly donated all the paint and all other required materials in order that this work could be carried out. So a massive thanks to Brian Stewart and Tony Linn, for their very generous donation. Below Community Payback Team carrying out very much needed painting.